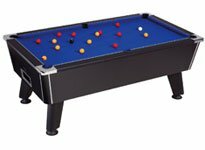 We have been supplying pool tables to Leeds online for over 10 years - and can have your new table professionally delivered extremely quickly. 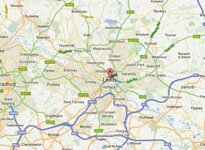 Leeds is one of the most popular location for Liberty Games to deliver a pool table to. So much so that we have changed the deliver routes of our two-man slate bed pool table delivery and installation teams so that they visit Leeds more often! Not only that our boxed pool tables (so MDF, fun and folding tables) can be with you within 48 hours as Leeds is located very close to our northern distribution hub – we like to think that Liberty Games has the fastest delivery of games tables in the whole of the UK. Gavin runs a pub just outside Leeds city centre, and was looking to supplement his wet and dry income. After talking to several local amusement equipment rental companies, Gavin realized that given a couple of months takings actually buying a pool table world pay for itself, after which he’d be able to keep 100% of the takings. Gavin wanted the minimum of hassle with the table so he selected the electronic coin mechanism, which although more expensive is less prone to jamming thus making his life much easier. We recently spoke to Gavin when he telephoned to order some extra chalk for his table, and just as he predicted the table is now an excellent earner. Anthony is a young professional living in the city centre of Leeds. He’s a keen pool player who likes to practice his game (which helps hustling friends down the pub on the weekend!). However, living in a flat, Anthony doesn’t have the space to have a pool table permanently in place. Luckily the deluxe foldaway table is an excellent compromise for people who need a quality pool table, but not all the time. 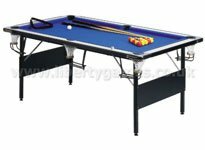 It is made in the same way as the slate bed tables, and has a slate bed play surface for a smooth play, with tournament quality cushions for a true response. So now Anthony can play pool when he fancies, and get his lounge back the rest of the time! Don’t forget that Liberty Games have a huge range of different pool tables, so if you are like Anthony and have limited space, or if you want a gigantic 12ft snooker table, we are here to help. We can deliver to all areas of Leeds very quickly, so please click here to see our entire range of pool tables, or of course give one of our sales team a call free on 0800 612 8180.